Puppy chow round two! 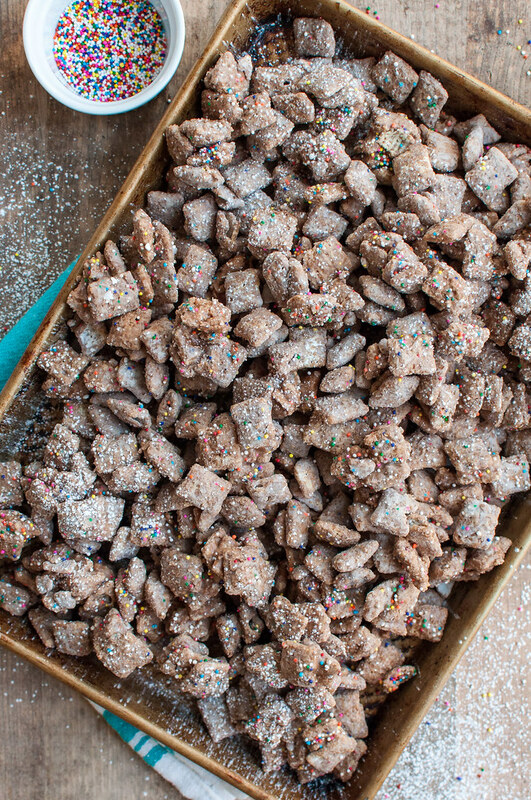 Not too long ago, I published a dessert recipe for my personal favorite puppy chow recipe. 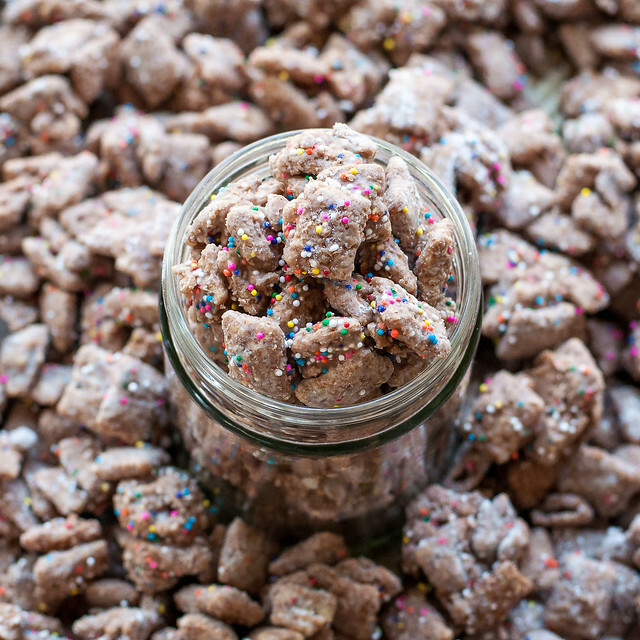 That’s right, if you grow up in the midwest, there’s a solid chance you have multiple recipes for peanut butter and chocolate puppy chow, aka cereal clusters. 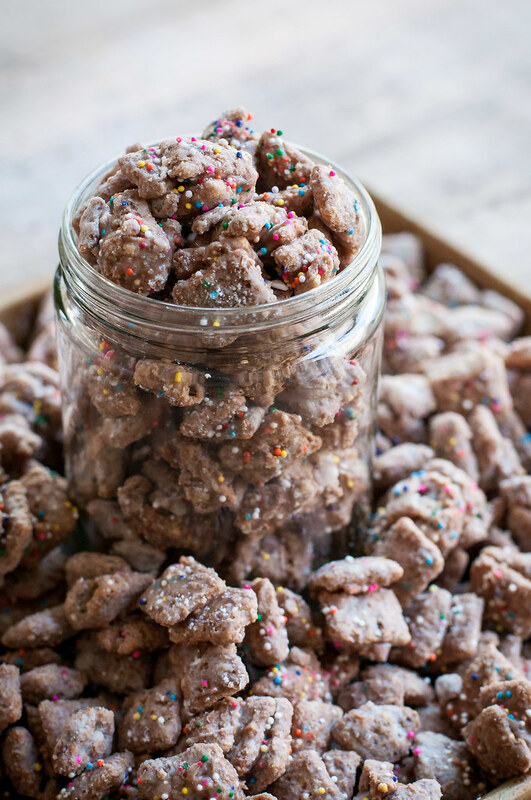 Of course, it’s way more fun to call it puppy chow, and when we were in second grade we thought we were being gross by offering our friends a bite of this so-called dog food. 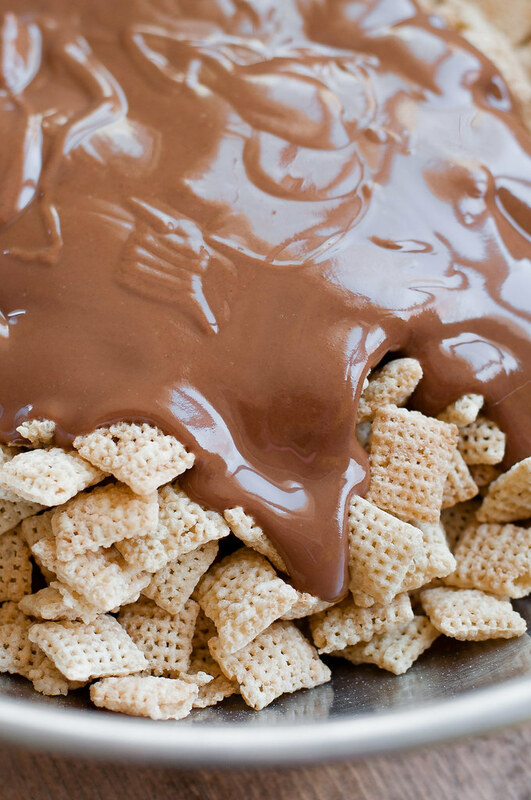 Since this snack has a special place in my heart, like so much of the food I share on Natural Comfort Kitchen, it’s only fair that I reveal my runner-up chocolate puppy chow recipe. This one, unlike the first, is coated in a healthy dusting of powdered sugar (it’s best made in the summer, outdoors, to minimize powdered sugar cleanup), omits the butterscotch chips (you could say the ingredients are a tad more pantry ready), and still has plenty of sprinkles! I like the tiny polka dots for this recipe, but feel free to play around depending on the occasion or what sprinkles you have leftover from your last dessert adventure. One positive noteworthy finding from recipe testing: adding the sprinkles at the same time as the powdered sugar works best. The sprinkles will not melt (at least mine didn’t), as I feared they might when exposed to a mixture of hot and gooey peanut butter, chocolate, and butter. Oh yeahhhhhh…I forgot to mention there is no shortage of butter in this puppy chow recipe. I sound like I’m on repeat, but on the rare occasion I publish a dessert recipe here on the blog, it ain’t gonna be no healthy, raw, vegan dessert that, I swear, tastes like the real thing. I’m not opposed to healthy desserts, especially if you have an insatiable sweet tooth, but I’d rather refrain from sweets for two weeks and then go reaaallll big. Who’s with me? Other areas of life in which I’ve recently been going real big: crashing my new bike (I’m okay, but more on that another day), seasonal allergies, and my vehicle! Well, almost. Do you remember my law enforcing friend from the other day? I try not to, but of course I couldn’t help it as I sat at the DMV for three hours last week, trying to renew the registration on my Jetta which will be shortly retired anyway, and having to leave to go let the dog out an hour before I even got to handle my transaction. I came home absolutely fuming, but luckily there was a pug puppy there to lick away my tears and frustration and inspire new ideas. Like donating the Jetta, which doesn’t require a registration, and yields a tax deduction about the magnitude of its (minimal) trade in value. The cherry on top was that I came up with the idea before my super-resourceful hubs. So proud. This morning, there was test driving of a Chevy Colorado pickup! Oh yeah, I told you I go big. It’s always been a weird unexplainable dream of mine to be the little girl drivin’ the big truck, and thanks to my amazing, hard-working, secretly redneck husband, that dream is likely about to become a reality. I say it’s a great deal, because as a rough-and-tumble guy at heart, he definitely won’t object to the pickup as one of our family cars. Especially because I didn’t request to paint it pink. Although white seems to be equally difficult to find in stock up here in the luxury car-driving northeast. There are sure to be many wannabe-southern-looking pictures as soon as the truck purchase comes to pass, so stay tuned on Twitter. And, if you take any pride in your mode of transportation, do not go eating this peanut-buttery sprinkled chocolate puppy chow in or on it. It’s addictive, it’s sweet, it’s sprinkled, and it’s sure to satisfy your sweet tooth, but it is NOT, in any way, a neat and tidy snack or treat. Place cereal in a large mixing bowl or roasting pan. Mix powdered sugar and all the sprinkles in a paper grocery bag. Measure chocolate chips, peanut butter, and butter into a medium microwave safe bowl. Microwave (see notes) in 30 second intervals on high for 1 to 2 minutes, stirring after each interval, even if the chips don't look melted. When chips are nearly melted, stir to finish melting them completely, then stir in the sea salt. Scrape chocolate mixture into the cereal and fold together to combine until you can barely see any dry cereal. Add coated cereal to bag with powdered sugar and sprinkles, fold the top over a couple times, and shake vigorously until just coated in powdered sugar. Don't shake against any hard surfaces, only in your hands, otherwise the cereal will break into pieces. Place puppy chow in an airtight container and refrigerate until set. It's best served chilled but can stand at room temperature for about 30 minutes to an hour, just have plenty of napkins handy. Instead of microwaving the peanut butter mixture, you can heat it in a double boiler or very gently in a saucepan directly over the heat, stirring often. Note: This page contains affiliate links. It does NOT contain sponsored content. 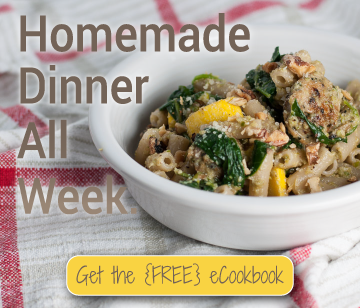 Affiliate links (to products I recommend, on Amazon) offset my ingredient and website maintenance costs, so I can keep bringing you retro recipes like this one. Thanks!